Dr. Nebojša J. Labus, BS Phys.Chem. Nebojša Labus was born on January 21, 1967 in Novi Sad. He draguated from the Faculty of Physical Chemistry in Belgtade in 1999. In 2005, he received his M.Sc. degree from the Technical Faculty in Čačak (the title of M.Sc. thesis: The Influence of Mechanical Activation on the Synthesis of Zinc Metatitanate). In 2011, he defended the doctoral thesis titled "Sintering and Properties of Sintered ZnTiO3" at the Faculty of Physical Chemistry of the University of Belgrade. In 2018, he was elected Senior Research Associate. 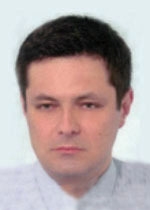 Nebojša Labus has been working at the Institute since 2001. T. Srećković, N. Obradović , N. Labus, Lj. Živković, "Enhancing synthesis and sintering of zinc titanate using mechanical activation" , Mat. Sci. Forum , 453-454 (2004), 435-440. M. V. Nikolić , N. Labus, M.M. Ristić, “A Phenomenological Analysis of Sintering Kinetics from Viewpint of Activated Volume” , Science of Sintering, Vol. 37, No. 1 (2005), 19-25. N. Obradovic, N. Labus , T. Sreckovic, M.M. Ristic, "Dilatometer investigations of reactive sintering of zinc titanate ceramics", Materials Science Forum , Vol. 494 (2005) 411-416. M.V. Nikolić, V.P. Pavlović, V.B. Pavlović, N. Labus , B. Stojanović, "Application of the master sintering curve theory to non-isothermal sintering of BaTiO3 ceramics", Materials Science Forum , Vol. 494 (2005) 417-422. N. Obradović, N. Labus, T. Srećković, D. Minić, M.M. Ristić, "Synthesis and characterization of zinc titanate nano-crystal powders obtained by mechanical activation", Science of Sintering 37 (2005) 123-129. N. Labus , N. Obradović, T. Srećković, V. Mitić , M.M. Ristić, "Influence of mechanical activation on synthesis of zinc metatitanate", Science of Sintering 37, (2005), 115-122. N. Obradović, N. Labus, T. Srećković, M. M. Ristić, “The influence of tribophysical activation on Zn2TiO4 synthesis”, Mat. Sci. Forum, 518 (2006), 131-136. N. Obradović, N. Labus, T. Srećković, S. Stevanović, “Reaction sintering of 2ZnO-TiO2”, Sci. Sint., 39 (2007) 127-132 (doi:10.2298/SOS0702127O). P.M. Nikolić, K.M. Paraskevopoulos, T.T. Zorba, E. Pavlidou, N. Kantiranis, S.S. Vujović, O.A. Aleksić, M.V. Nikolić, T. Ivetić, S. Savić, N. Labus, V. Blagojević, "Far Infrared Properties of Sintered PbTe Doped with Boron", Science of Sintering, Vol. 39, No. 3 (2007) 223-228. S. Stevanovic, V. Zeljkovic, N. Obradovic, N. Labus, "Investigation of sintering kinetics of ZnO by observing reduction of the specific surface area", Science of Sintering, Vol. 39 (2007) 259-265 (doi: 10.2298/SOS0703259S). N. Labus, S. Stevanovic, M.M. Ristic, "Sintering of mechanically activated Zno-TiO2 powders", Powder Metallurgy and Metal Ceramics 47 (2008) 40-46. P.M. Nikolic, S.S. Vujatovic, D. Golic, N.J. Labus, K.M. Paraskevopoulos, K.T. Zorbas, M.V. Nikolic, A. Bojicic, V. Blagojevic, W. Koenig, "Far infrared spectroscopy of Pb0.85Sn0.15Te alloy doped with Ni", International Journal of Materials Research 99 (2008) 1393-1396 (DOI: 10.3139/146.101772). P.M. Nikolić, K.M. Paraskevopoulos, S.R. Djukić, S.S, Vujatović, N.J. Labus, T.T. Zorba, M. Jović, M.V. Nikolić, A. Bojčić, V. Blagojević, B, Stamenović, W. Koenig, W. "Far infrared study of impurity local modes in palladium-doped PbTe and PbSnTe", Journal of Alloys and Compounds 475 (2009) 930-934 (doi: 10.1016/j.jallcom.2008.08.069). M.V. Nikolic, N. Labus, M.M. Ristic, Densification rate and phase structure changes during sintering of zinc titanate ceramics, Ceramics International 35 (2009) 3217-3220 (doi:10.1016/j.ceramint.2009.05.028). P. M. Nikolić, K. M. Paraskevopoulos, M. V. Nikolić, S. S. Vujatović, E. Pavlidou, T. T. Zorba, T. Ivetić, B. Stamenović, N. Labus, M. Jović, M. M. Ristić, Far infrared properties of sintered Pb0.9Sn0.1Te doped with Palladium, Powder Metallurgy and Metal Ceramics 48 (2009) 353-357 (doi:10.1007/s11106-009-9122-y). B. Matovic, D. Nikolic, N. Labus, S. Ilic, V. Maksimovic, J. Lukovic, D. Bucevac, "Preparation and properties of porous, biomorphic, ceria ceramics for immobilization of Sr isotopes", Ceramics International, 39, 8 (2013) 9645-96492013, http://dx.doi.org/10.1016/j.ceramint.2013.05.086. Z. Z. Djuric, O. S. Aleksic, M. V. Nikolic, N. Labus, M. Radovanovic, M. D. Lukovic, "Structural and electrical properties of sintered Fe2O3/TiO2 nanopowder mixtures", Ceramics International 40, 9 (2014) 15131–15141, http://dx.doi.org/10.1016/j.ceramint.2014.06.126. N. Labus, S. Mentus, Z. Z. Đurić, M. V. Nikolić, "Influence of nitrogen and air atmosphere during thermal treatment on micro and nano sized powders and sintered TiO2 specimens", Science of Sintering, 46, 3 (2014) 365-375, http://dx.doi.org/10.2298/SOS1403365L. N. Labus, S. Mentus, S. Rakic, Z. Z. Djuric, J. Vujancevic, M. V. Nikolic, "Reheating of zinc-titanate sintered specimens", Science of Sintering 47, 1 (2015) 71–81, http://dx.doi.org/10.2298/SOS1501071L. O. S. Aleksić, Z. Z. Vasiljević, M. Vujković, M. Nikolić, N. Labus, M. D. Luković, M. V. Nikolić, " Structural and electronic properties of screen-printed Fe2O3/TiO2 thick films and their photoelectrochemical behavior", Journal of Materials Science, 2017, https://doi.org/10.1007/s10853-017-0830-2. E. Požega, P. Nikolić, S. Bernik, L. Gomidželović, N. Labus, M. Radovanović, S. Marjanović, "Synthesis and investigation of BiSbTeSe single crystal doped with Zr produced using Bridgman method", Revista de Metalurgia 53, 3 (2017) http://revistademetalurgia.revistas.csic.es/index.php/revistademetalurgia/article/view/1417/1645. N. Labus, Z. Ž. Vasiljević, D. Vasiljević-Radović, S. Rakić, M. V. Nikolić, "Two step sintering of ZnTiO3 nanopowder", Science of Sintering 49, 1 (2017) 51–60, https://doi.org/10.2298/SOS1701051L. N. Labus, Z. Vasiljevic, O. Aleksic, M. Lukovic, S. Markovic, V. Pavlovic, S. Mentus, M. V. Nikolic, "Characterisation of Mn0.63Zn0.37Fe2O4 powders after intensive milling and subsequent thermal treatment", Science of Sintering 49, 4 (2017) 455–467, https://doi.org/10.2298/SOS1704455L. S. D. Matijašević, S. R. Grujić, V. S. Topalović, J. D. Nikolić, S. V. Smiljanić, N. J. Labus, V. V. Savić, 2018, "Non-isothermal crystallization of lithium germanophosphate glass studied by different kinetic methods", Science of Sintering, 50 (2018) 193–203, https://doi.org/10.2298/SOS1802193M. M. V. Nikolic, M. D. Lukovic, Z. Z. Vasiljevic, N. J. Labus, O. S. Aleksic, Humidity sensing potential of Fe2TiO5 - pseudobrookite. Journal of Materials Science: Materials in Electronics, 277 (2018) 654-664, https://doi.org/10.1007/s10854-018-8951-1. D. A. Kosanović, V. A. Blagojević, N. J. Labus, N. B. Tadić, V. B. Pavlović, M. M. Ristić, "Effect of chemical composition on microstructural properties and sintering kinetics of (Ba,Sr)TiO3 powders", Science of Sintering 50 (2018) 29–38, https://doi.org/10.2298/SOS1801029K.